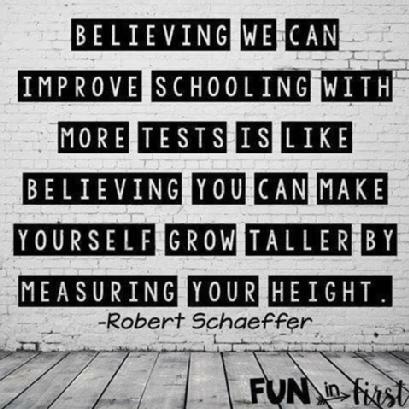 "Believing we can improve schooling with more tests is like believing you can make yourself grow taller by measuring your height." It's catchy, but it's not quite true. The problem is that testing produces feedback which is used to modify the educational approach. No-one wants to be responsible for a generation that failed, so no-one is willing to experiment, instead they try to do what will 'work' and what will 'improve' results, when in reality we can't predict what will work. Testing is part of the scientific method, and an equally important part of that method is a willingness to fail in the pursuit of knowledge. Testing allows us to find a causal link between educational methods and improved educational output, but no-one is willing to actually test objectively, so instead we have year after year of politicians meddling based on what the latest trendy theory is without objectively testing those theories. No parent wants their children to be in the control group! To be fair, Robert's soundbite is part of a campaign to "end the misuses and flaws of standardized testing and to ensure that evaluation of students, teachers and schools is fair, open, valid and educationally beneficial." FairTest campaign against the sheep dip evaluation of students. But how else can we compare them? We all want to be treated as individuals. We all want to be special. But the educational system can't cope with 1.4 billion individuals. It doesn't seem right to compare students, because everyone is special, but if we are to make selections then we do have to apply a criteria. Do we want to limit our children's future lives just because they failed a maths test? No. But if you were on the operating table, you'd want the best doctor. We're all socialists when it comes to other people. We can improve schooling with more tests, but those tests have to be used to determine a causal relationship between teaching methods and... and... what? We don't even know what we want children to do when they leave school, so how can we improve their ability to do it. Instead, we have to apply the narrow criteria of suitability for the workplace, and we know that not everyone suits the workplace. We can't filter out the entrepreneurs at age 5, because every parent wants their child to be an entrepreneur. And a doctor. And an airline pilot. And a beauty queen. And a film star. As soon as we create a test we impose a ranking, and every parent believes that their child deserves to be at the top. Testing isn't the problem. Society's obsession with success is the problem.